Fred Owen at the wheel of a Bedford Duple purchased second-hand from Don Everall’s in Wolverhampton in the mid 70’s. it is believed to be an excursion from the local sewing factory or the ‘Knicker Factory’ as it was better known! 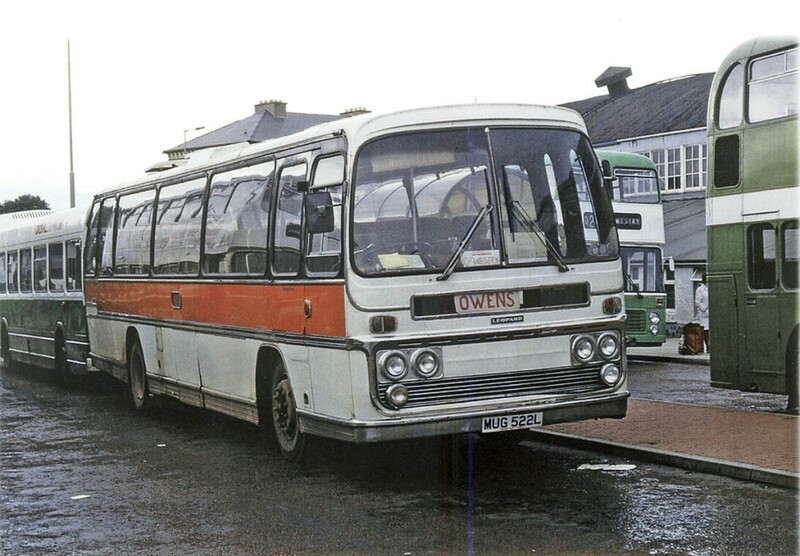 Owen’s of Oswestry began with one Duple bodied Bedford executive coach, complete with a central bar and stools, by Fred Owen in the early 1970s, as a sideline to his main business. The coach operation was started by Fred Owen as a sideline to his main business and his son Mike became the Managing Director of the business in the 1990s. Fred maintained an active role well into his seventies, until he passed away ten years ago. After completing his National Service in the RAF, Fred became an apprentice motor mechanic, eventually owning two garages, one in nearby Whittington and the other across the Welsh border in Corwen where he purchased his first coach. As Mike explained, ‘Dad was very entrepreneurial and always wheeling and dealing. He had a café, bingo hall, taxi company, scrapyard and pizza restaurant. In his teens, Mike used to help out in the garage during school holidays, taking up a mechanical apprenticeship with a haulage company when he left school. In 1977, he left to run the taxi company with his brother. It was whilst running the taxis that they started the holidays, producing a photocopied brochure with about six departures. Soon after he opened the premises in Corwen, Fred acquired Hughes Brothers of Llansilin, a small operator of around five vehicles. 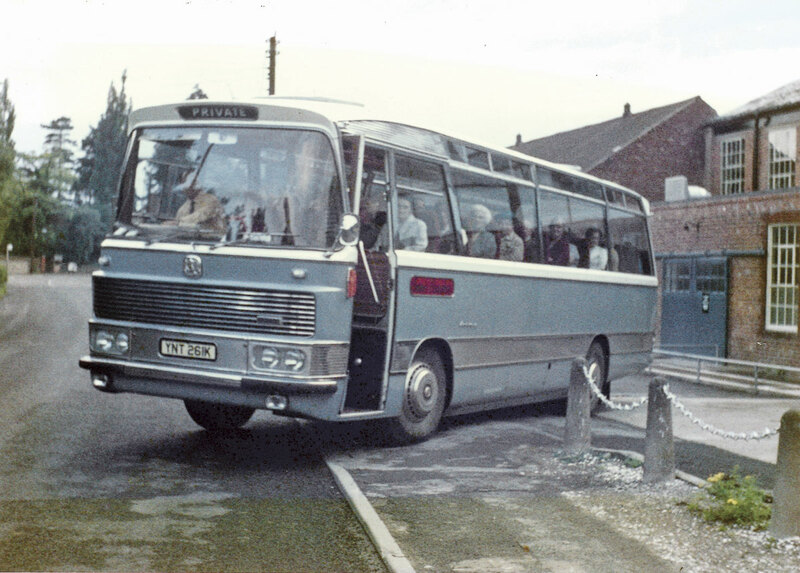 In 1982, they bought the coach side of Parish Motor Services, some eight to ten vehicles, and later that decade, Hampsons Coaches went into receivership and Owen’s acquired the business, relocating to their depot in the centre of Oswestry as they had outgrown the Corwen site. At the time, they owned Rollings Motor Factors which sold spares and parts to the automotive industry. This was later renamed to Owen’s Motor Factors and the site by the railway was sold to Tesco for redevelopment, although the retailers never got planning permission to build their store! Just before the move to Four Crosses, they acquired Stratos Travel of Newtown, which included their Newtown bus services and five vehicles that were predominantly used for tour work. 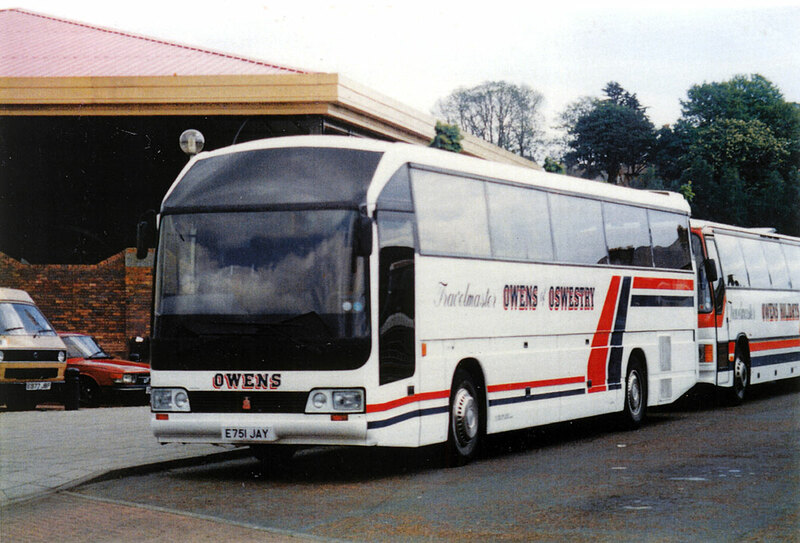 Owen’s retained a large percentage of the tour customers as well as the town service. The company now operates five bus services, two in Newtown, one in Welshpool and two that cover Foel including a market service to Llanfair Caereinion. Owen’s provide a number of additional market services across the local towns and realise the importance of these weekly services to the rural residents of Powys. These are subsidised by the local authority, Powys County Council, and Mike commented that despite the services having been extended recently to the middle of 2017, they are seriously under threat. He believes the town services are safe but is anticipating big changes nevertheless. He isn’t aware of any commercial services in the whole of Powys, but thought there might possibly be the one. 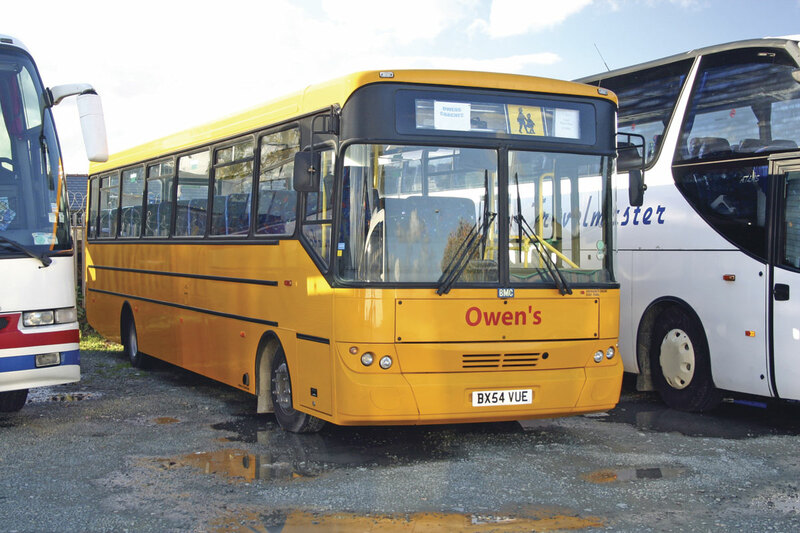 These contracts together with school contracts account for approximately 20% of Owens’ total business and they have to compete with Tanat Valley and Arriva as well as other smaller operators covering Oswestry and Celtic Travel who are a few miles south of Newtown. Mike is unusually understanding of the challenges that the councils face themselves with regards to huge cuts and job losses in the transport sectors and says that he has a good relationship with the local authorities and tries to work with them. Although they only operate school contracts with them, Mike praised Shropshire for being a good local authority. Despite waivering the cost of living increase last year which helped to assist with their budgeting, he was less enthusiastic about Powys and in particular, their tendering process. They don’t take into consideration your OCR score (Owen’s are green) and the MOT pass rate. 40% of the application is based on price and 60% on a quality score, which is a self completed declaration, as he explained, ‘less honest operators could lie so it’s actually rubbish.’ They do however have two operator meetings a year and when he comes to re-tender, the application will be based solely on price, not something Mike is overjoyed about. Drivers are a different challenge altogether and like many operators, they struggle getting new people into the business, both male and female, although one of his nephews has just joined the company in this capacity. Mike attributes this to a number of factors; the first being that the potential coach drivers they need can’t take their test until they are 21. With few apprenticeship or trainee opportunities, most 18 year olds that were considering driving as an occupation, are already well into another career by the time they reach the qualification age and are earning good money. Lifestyle is also a factor that comes into play, particularly within the tour side of the operation. Tour driving includes unsociable hours and overnight stays, sometimes for several consecutive nights and Mike has found this something that the younger generation are less keen to embrace, as they tend to be more family orientated than in the past. 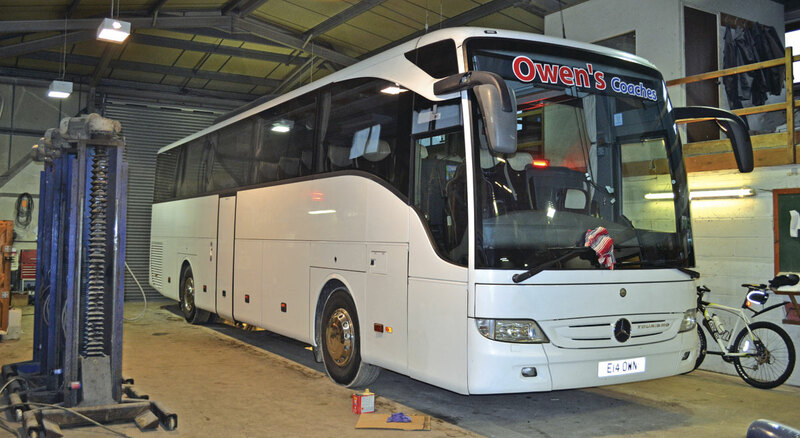 Short breaks and holidays equate to 35% of Owens’ turnover, with the company hosting between 160-170 tours per year. Despite describing this side of the business as ‘a bit stagnant’, sales are up 3.5% on last year. Average loadings for UK tours are 34 with 31 for continental. They own three travel agencies that operate under the brand Owen’s Travelmaster and are situated in Oswestry, Whitchurch and Newtown, a fourth ‘shop’ closed three years ago. ABTA approved and CITO (Consortium of Independent Tour Operators) members, they offer both their own tours and the CITO Holidays – Worldwide Air and Cruise. They have been members since 2002 after acquiring Stratos and have been working together on Worldwide Air and Cruise for four years; Mike commented that it was going very well. 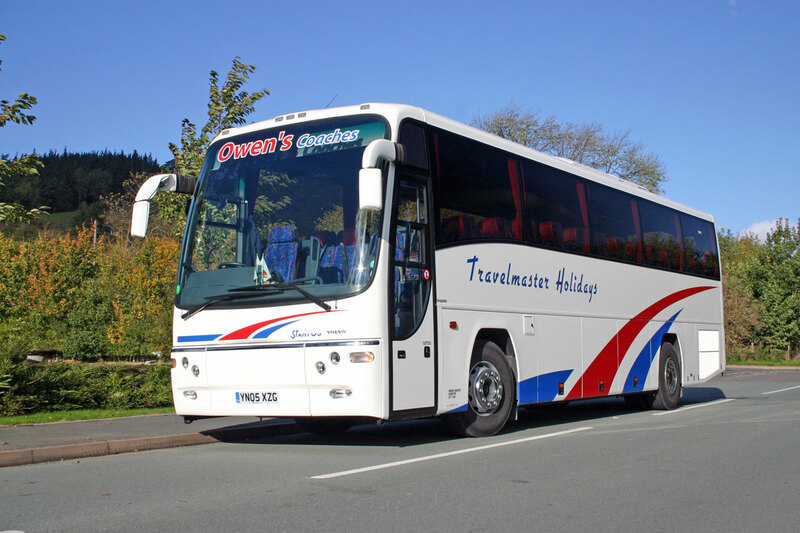 They have their own dedicated Purchasing Manager at CITO and these tours are still branded as Owen’s Travelmaster and are booked through them directly via the telephone. Their own website is in the process of being updated and they are working with Roeville, who provide their back office system, on an online booking system for the tours. At the moment, they don’t do any e-marketing to clients but this is something that they will do once the online booking is in place as this will facilitate this activity. In the mean time, their Facebook account is very active, with regular posts to promote their holidays. They have many repeat customers and during my visit they were preparing for their Customer Reunion Weekend in Yorkshire. They had 160 customers booked and last year the event raised £1200 for a local children’s hospice, thanks to a raffle with generous prizes donated from local businesses. The tour business is led by John Petherbridge, Tours Manager who joined the company with over twenty years experience from Shearings. In addition to the holidays they advertise in their brochures, which they produce twice yearly, between himself and Martyn, they tailor makes tours for schools and groups, with Martyn concentrating on the incoming enquiries. They work for three different companies on incoming trips and they had a 50% stake in a school travel company up to five years ago, when they parted company. The business got sold on the proviso that the new company continued to use Owen’s as it was an integral part of their business. After a few months, work dried up as the jobs were awarded elsewhere. This left Mike with a number of executive vehicles with no work for them. As ETOA (European Tour Operators Association) members, they attended one of their workshops and picked up a number of contracts there. Mike describes his fleet as a bit of a mixed bag. He has certain vehicles that he likes, in this case the Mercedes Tourismo. They operate four, mostly for tour work, ranging from five years down to one year old. 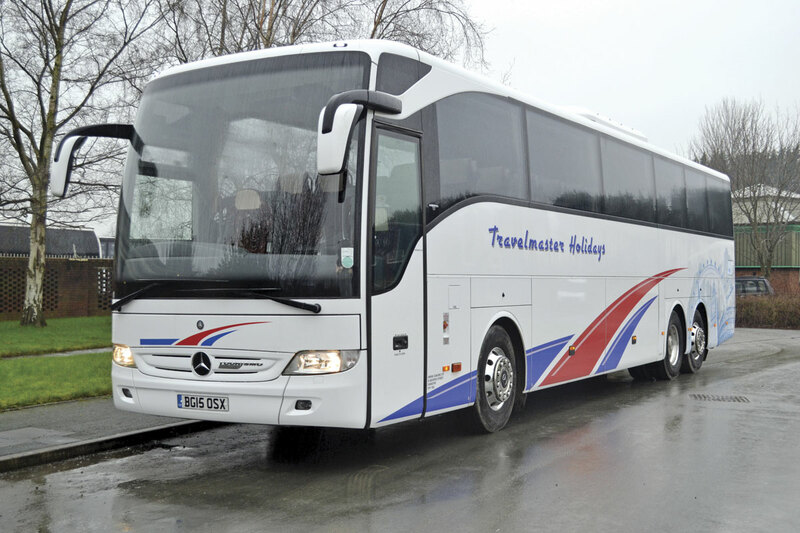 A new one is being delivered in April to replace a 2008, 55 seat Iveco Beulas which although this was part of a part exchange deal, he will keep for this season on lease from Mercedes. Mike has calculated that the cost of vehicles has gone up by £40,000 since 2012, meaning that the vehicle choice will be determined on price to a certain extent. He explained, ‘I’m instinctively price driven, it stems from Dad who always wanted to do a deal, of course it goes without saying that the quality has to be there’ This was one of the factors which led him to purchase a 12m and 9m Yutong last May, made to his specification. 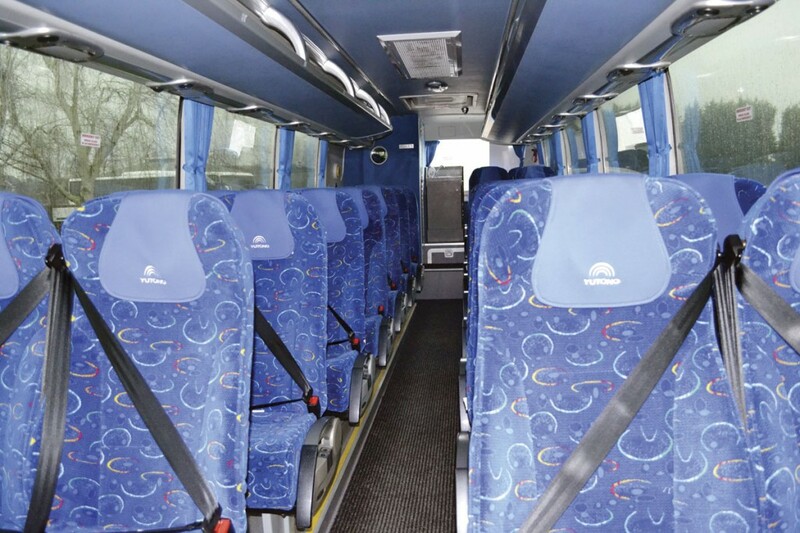 The 35 seat, 9m has a toilet fitted, as well as seatbelts, tables and magazine nets. The 12m was specified with 49 seats and came fitted with a toilet although the same extras as the 9m were added, along with aircraft lockers. There have been a couple of glitches and he is aware that the residual value is unlikely to be that of the Mercedes, but overall, he is happy with the vehicles. The second hand sale price is something that has to be factored in, they owned two Ayats including one of the first in the UK, which, in Mike’s words ‘were lovely coaches, but not worth much when we wanted to trade them in.’ They also previously owned a number of double deckers which they ran for about four years, but proved not to be cost effective as they were limited to the jobs that they could be used on. 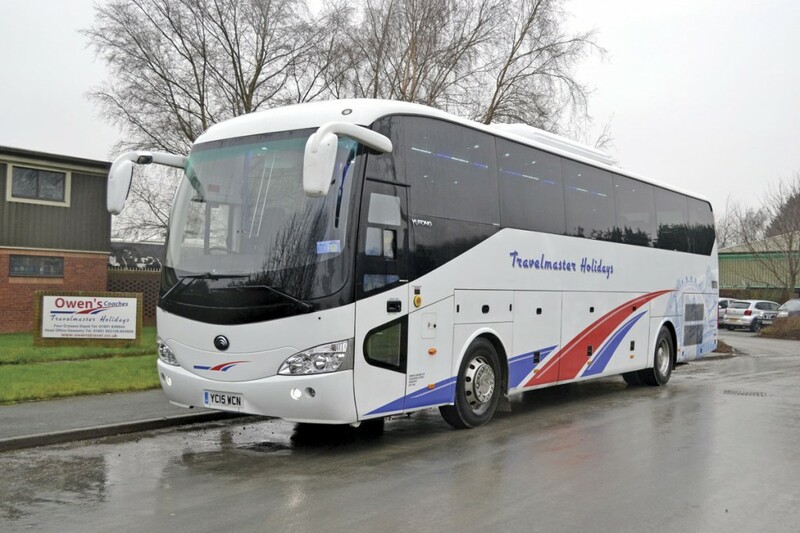 Completing the tour fleet is an 07 Setra and two executive MAN Tourliners; a 12m 49-seater and 14m tri-axle with 61 seats. The ‘second tier’ schools and private hire fleet consists of five Plaxton vehicles, two of which are 05 Volvo B12s, a 2000 Volvo B10M and two 03 Dennis ex Alpha, most of which have been upseated to 53, 55 or 57 seats. Also within the fleet are the bus service vehicles; three Optare Solos, a Dennis Pointer Dart which is due to be replaced with another used Solo, an 06 29 seat Cheetah which they are also looking to replace with a newer model, a 16 seat 07 Sprinter, a 2004 BMC school bus, two BMC service buses and a small 26 seat BMC Nifty. Owen’s were a former BMC sales agent, something that may well have stemmed from Fred having previously been an approved BMC automotive dealer. Mike was very candid about the relationship, which lasted a couple of years, saying, ‘It cost us a lot of money and it was a steep learning curve.’ They sold a number of the school buses and a few Probus, but were left absorbing the cost of warranty work on a number of engineering issues. I asked Mike whether they would consider becoming an agent again in the future. He doesn’t believe that coach operators and sales agents are a particularly good mix as you have to have so many things in place, but he did conclude by saying ‘never say never’! There is a dedicated workshop on site with space for two vehicles, although this would be a bit of a squeeze with two large coaches. Where possible, any bodywork repairs are undertaken on the premises and they employ a full time mechanic that has experience in this field and a nephew of Mike’s who assists as required. MOT pre-checks are also done in house and their pass rate is very good. The test itself is performed at a commercial service garage near Welshpool, approximately ten miles away. Fortunately, on the same industrial park is Tomley Commercials who manage their six weekly checks and maintenance schedule. Over the last year they have invested in the fleet from the bottom up, in an effort to upgrade it. With the exception of the dedicated school bus, Mike explained that they try to run a fleet that was dual purpose. A number of the vehicles have been re-trimmed and they use Brackley based Duoflex for this, whom they have built up a good relationship with over the years. One of Mike’s pet hates is blown double glazing and dirty vehicles. They have a walk round wash and are looking at investing in a vehicle wash, which will save a lot of time but as he explained. 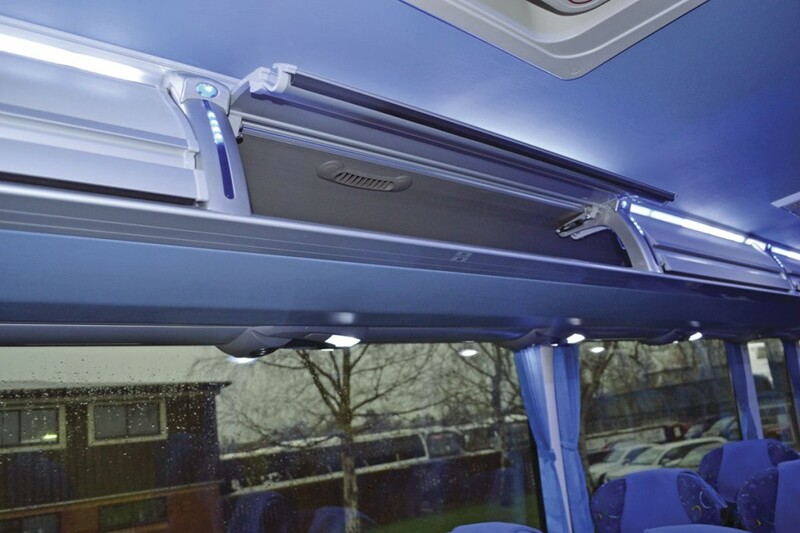 ‘It’s a huge investment, I could buy a new coach for the same price.’ The company is in the fortunate position that only a small number of vehicles are on short term finance, with the majority of the fleet being owned out right. Owen’s is still very much a family business although Mike’s brother and sister are no longer employed by the company. His sister remains a shareholder and it is the next generation that have taken over some of the roles. His daughter Emma has been with the company for three years; she has a degree in tourism management and is the Office Manager with the additional responsibility of looking after the accounts. As previously mentioned, his two nephews, Alex and Harry Gunn are also now a key part of the team, having worked their way from the bottom up. There was a real ‘one big family’ feel to Owen’s and Mike explained that they were very much ‘all hands on deck.’ As well as the twenty full time drivers employed, there are ten casuals on the books for private hire work and Martyn Hall, the Sales and Marking Manager drives, as does Lynn Townsend Jones, the Operations Manager and Mike, when needed. It seems that only Harvey, Lynn’s chocolate Labrador and office mascot, is yet to pass his test! All staff are provided with a uniform and Mike tries to schedule drivers onto the same job as he feels that it is very important that they get to know their customers. Unfortunately, the nature of last minute incoming work means that forward scheduling is often difficult to do more than a couple of weeks in advance, although tour work is more static. To assist in driver training, all vehicles are fitted with a telematics system, which provides a tracking service as well as highlighting driver behaviour such as excessive idling and speeding. They implemented this around eight years ago with a Fleetmatics product, which Mike described as excellent. More recently he has used a local company called Plant-i who he said were easy to work with and offered good support. He is looking into installing forward facing cameras for insurance purposes and we discussed whether CCTV would be considered at the same time. Fortunately, the company has not had any problems with passenger behaviour. Training is something that the company takes seriously, investing both time and money to not only ensure drivers are compliant, but also to get the best out of the entire team. CPC courses are usually run in house and tailor made to suit their needs rather than just doing the same modules five times. They use the services of local operator Tanat Valley or Squire Management and Training in Birmingham. Drivers are also trained by themselves and a new driver had just started when I visited. Mike, like many operators, struggles to find and sometimes retain, experienced drivers because the very nature of the work, tours specifically, interferes with home life. However, his latest starter he described as ‘very enthusiastic, which goes a long way when inexperienced.’ That said, Owens’ has a number of drivers who have been with them for many years and Dai is the longest serving, having joined the company over thirty years ago. The livery has been adapted over the years, but has always retained the red, white and blue. They have been working with a local company, Now Signs in Oswestry, to produce a more modern, rounded approach that also incorporates the Welsh dragon, which they feel to be more fitting of a border operator. Mike is quite adamant that he is not going to take after his father and be working in his seventies! He thinks that maybe his nephews might be well placed in the future to take over the family business and joked that he now no longer has a retirement fund! They recently took on three more O licenses, going from 21 to 24 last year and so from an expansion perspective, Mike feels that they are at their optimum. That said, they are always ‘on the look out’ and if the option arose to acquire a business and or their vehicles, they would certainly give it full consideration, of course, his nephews may have other ideas!